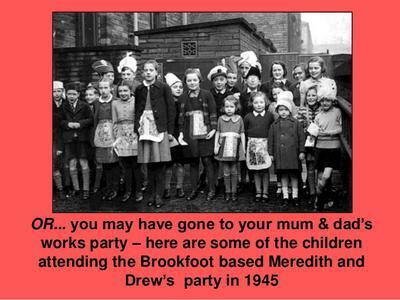 The photo of the children attending the Meredith & Drew's Christmas party in 1945(see Brighouse page), was held in the School room of the Primitive Methodist Chapel at Lane Head. As well as the funny hat my present was a wooden model of a Royal Navy destroyer. I cannot remember any of the children's names, since they lived all around the Brighouse district, I was the only child from my locality.